inspired by amateurs: Will the block topple? If you place a cuboidal block in water it will float if it is lighter than water, but in what position. If you lay a block flat it will float like that, but if it is put standing, it may float, or may fall to a flatter position. This much is observation, or just intution, but I wanted to get there mathematically. I wanted to find an expression which would tell me if the block will fall, or not. om the position, i deflect it by a small angle θ and check if a restoring couple is created by the pair of forces (weight and buoyancy) or if the couple helps topple the block. 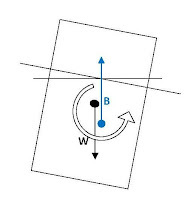 Simple, find the center of buoyancy and the center of gravity after tilting the block by a small angle. Check the points at which the buoyancy and weight act, to see the direction of the couple formed. respect to the flat one, difficult it should be to float. lution, here is the diagram. 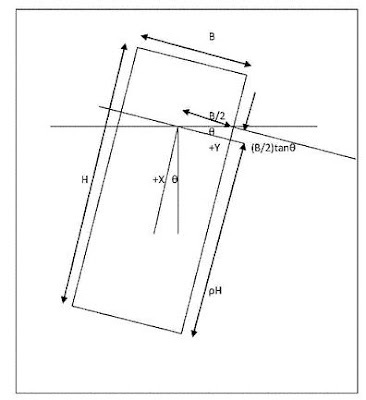 All the required dimensions are marked. The block has been tilted by an angle θ. The axes X and Y are stuck to the blocks flat position, thus tilted to vertical and horizontal by θ.
f the liquid is ρ the displaced volume of the solid so that it is in equilibrium is ρHB (third dimension is 1, say). Thus the average depth in water is ρH. Another parameter η has been used which just defines the shape of the block. η=B/H. while the base is at a depth of below the water level. Thus the distance from the origin is (ρH-B/2), and hence the horizontal distance is (ρH-B/2)sinθ. After coming this far, now i do not know how correct this is and more importantly i had fun doing all this but what do i do with it now! kya tha be ye sab/??!!!! i dont think that the rod/block will be floating erect. 2. other forces, like air drag, low pressure zone created due to velocity of air. so i assume the block will be a bit tilted from the very beginning. now if u give a tap (say theta) and it starts oscillating then it may cross the vertical position and then force will start acting in totally different direction. not as much fun as i had reading it, thats for sure. math blows holes in my brain and that was a lot of match vocabulary for a visual observation.